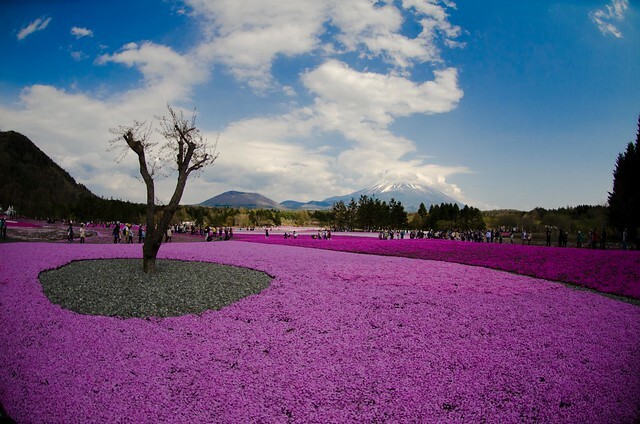 One of the popular destinations in Japan this springtime is shibazakura (cherry lawn in English). Shibazakura is all over Japan but one of the most visited places is at Motosuko, near Mt. Fuji. I always see posters about it and when my friends planned to go on a trip, I confirmed my attendance without really knowing the details. I was thinking whether to still go with them on this particular trip since I just recover with my bout against influenza. I was feeling okay so I decided to join. Glad I did. It was a visual treat and Mt. Fuji showed up that day, though a little bit shy. The place was packed with people and it was very difficult to take a photo without including them. I didn't take a lot of photos, I just enjoyed the view. The trip was great. However, though maybe unrelated, I got knocked-out again after with an inflammation of tonsils. Yes, I was absent from work. Hope you are fine now and spirits are rekindled...beautiful pictures.. Thanks Ramesh. so far so good. still have to finish the antibiotics though. Beautiful photo and poem -- thank you for sharing. You're welcome Pam. Thanks too! Amazingly gorgeous photo and love your haiku! Love the picture & the poem. I had that virus; it's nasty. oh so pretty John, hope you feel better. I guess you may need really rest as we do get easily beaten up with influenza when we are physically and mentally tired, immune system too tired to fight the enemies. yeah, i just wanted to sleep for 1 week haha. I love the view. You must rest, totomai. YOLO. stunning photography and perfect haiku! Currently compiling the list of must visits in Japan. It seems like one week isn't even enough! Kyoto, Tokyo, Osaka, and now this. Great photos (and I am not just talking about this post)! The colors are really amazing! and thus unappealing they had been scared of distressing child. meal termination point as well as the electronic a moment functions. Decide thats generally better for you.